Cyril Lancelin is the name of the French artist and architect who is behind “town and concrete” and who, since 2016, has been planting his outsized installations in the most renowned museums and beyond. Lancelin employs parametric architectural tools in order to implement a vocabulary of basic shapes, redefined within a new, almost dystopic reality. Each tour is an experiential process and a brain game of conversing with a literal, tangible volumetry. A journey through a hyperrealistic environment, always with an exploratory attitude. 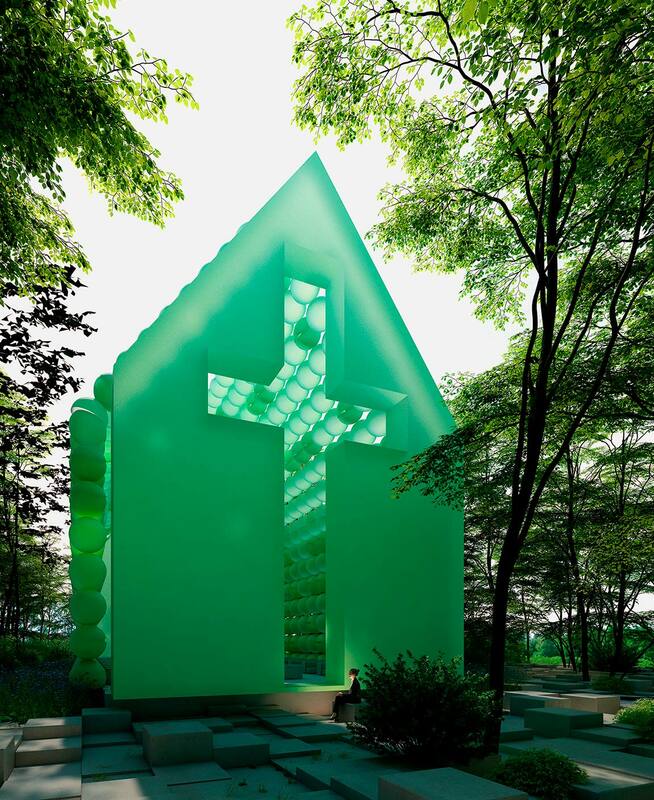 The Green Chapel is a characteristic example of a conceptual structure. An outdoor chapel of an ephemeral nature, installed in and ultimately removed from a forest in Normandy, France. Its form was born of the vision and symbolism of light. A temple amidst nature, protected from direct rays yet at the same time bathed in sunlight and the moving shadows of the trees. Its interior relieved of the expected furniture and permeable by wind and rain, it is intended to be incorporated, in its simplest form, in its surroundings. 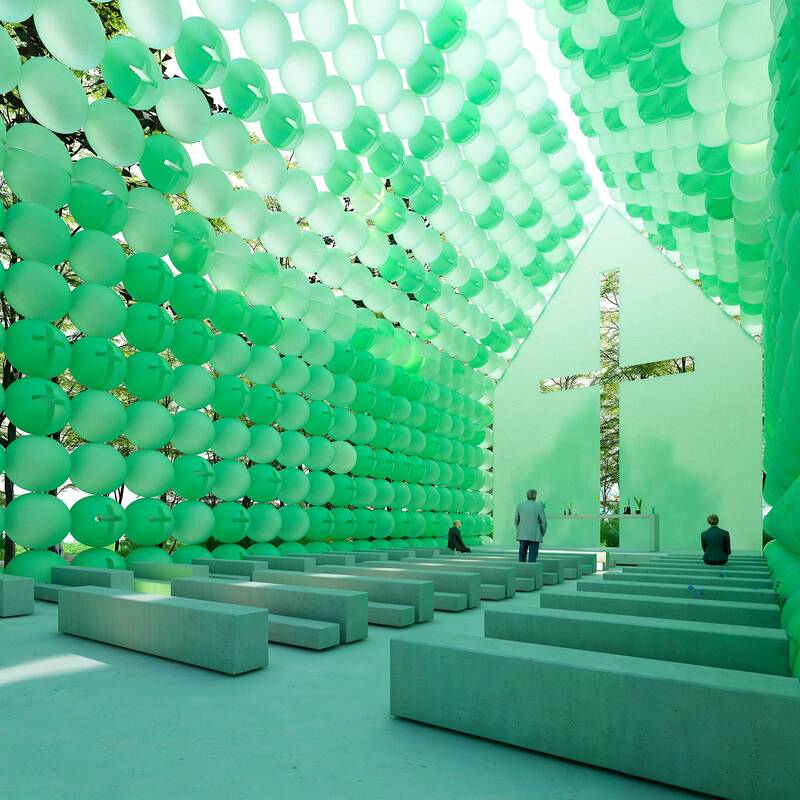 The chapel is constructed from a single unit, a sphere. 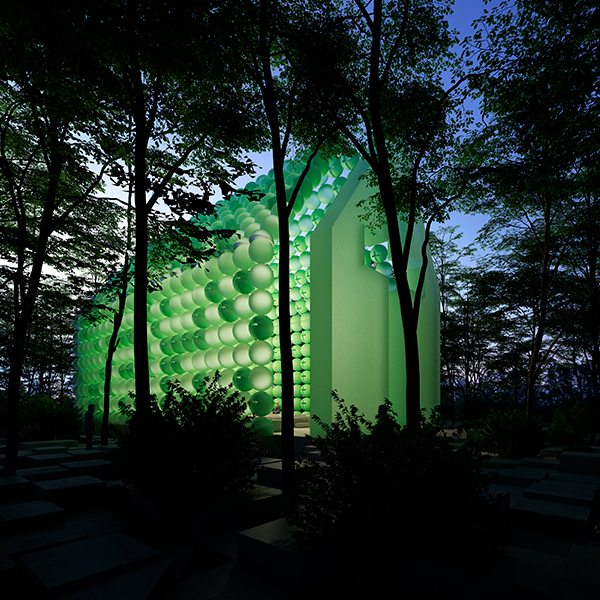 Multiple spheres are assembled together to create a green shell of light polycarbonate material, replete with incisions that permit direct communication with the surrounding forest. This is repeated in different directions in order to create the overall envelope. Only the entryway and sanctuary are composed of solid walls, perforated with cross shapes that function as entrances. A small oasis of suspension and serenity, ideal as a place of devotion. Ultimately, the benches may be the weightier volume. When the chapel is removed, it shall remain as a vestige, an impression in the middle of the forest.